It’s time to upgrade everything – with the brand new issue of T3 magazine, out now! Instant improvement for everything from your phone to your TV audio and even your DIY gear. Plus, get a FREE Anker battery pack with our special offer! The latest issue of T3 magazine is now on sale, which must mean it's time to upgrade everything – meet our pick of the best new gadgets for a better life! We've got easier ways to improve your home, hot new phones, Dolby Atmos soundbars, slick new watches and loads more… you can read a sample of the issue below to dive right in! Plus, right now, we're offering an Anker battery back thrown in with a six-month T3 subscription! 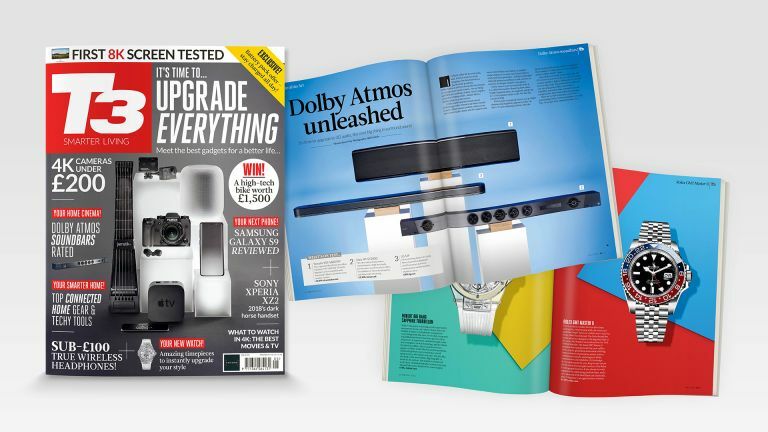 In this issue, you’ll find our in-depth guide to fixing up your home the easy way, with smarter, faster tools (and tips on making the most of your space); reviews of the best Dolby Atmos soundbars, to find out which will give you the home cinema experience you deserve; we review the Samsung Galaxy S9 and Sony Xperia XZ2 to see which is the Android flagship for you; true wireless headphones under £100; we pick the best new watches for an instant style upgrade; we reveal the best movies and TV shows to show off your 4K telly; and we reveal how to set up a secure smart garage. Plus! 4K action cams under £200 tested, we review an amazing new mirrorless camera and 4K drone, we show you how to get more from Apple HomePod, we look at the best smart bulbs, and loads more!